Sheriff Clarke Denounced This ‘Scam PAC’ — Why Won’t They Stop Using His Name For Money? A shady super PAC denounced by former Milwaukee County Sheriff David Clarke as a “scam PAC” is still using Clarke’s name to solicit donations for a Senate run that Clarke has repeatedly said isn’t happening. The PAC’s emails stand in sharp contrast to Clarke’s own words. 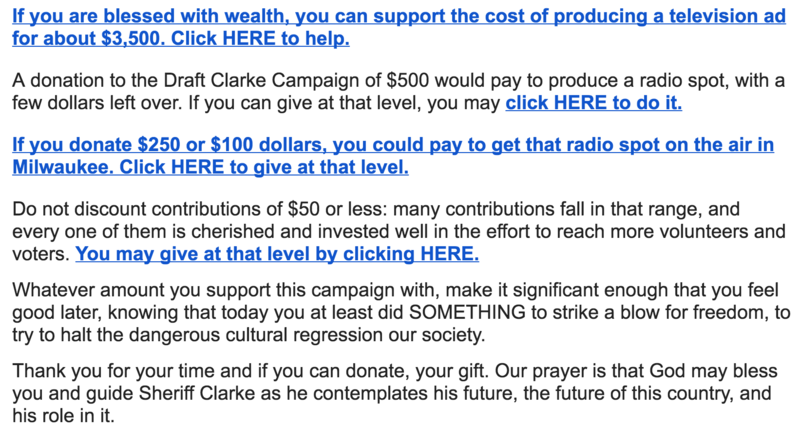 Clarke has specifically denounced the super PAC using his name to raise money for a Senate run that he says isn’t happening. “Every time I turn around, I talk to people and say, ‘No, I’m not running for Senate, hang onto your money,'” Clarke told the paper. The super PAC is trying hard to keep Clarke supporters from hanging onto their money. “If you are blessed with wealth, you can support the cost of producing a television ad for about $3,500. Click HERE to help,” the PAC’s email on Saturday said. The PAC has spent exactly zero dollars on “independent expenditures” — defined as money spent advocating for or against a candidate in an election — as of its most recent FEC filings. “In Wisconsin we have a race that pits a bitter lesbian extremist against a courageous conservative who you KNOW, beyond the shadow of a doubt, will stand up for our causes once he gets to Washington,” the most recent email reads. 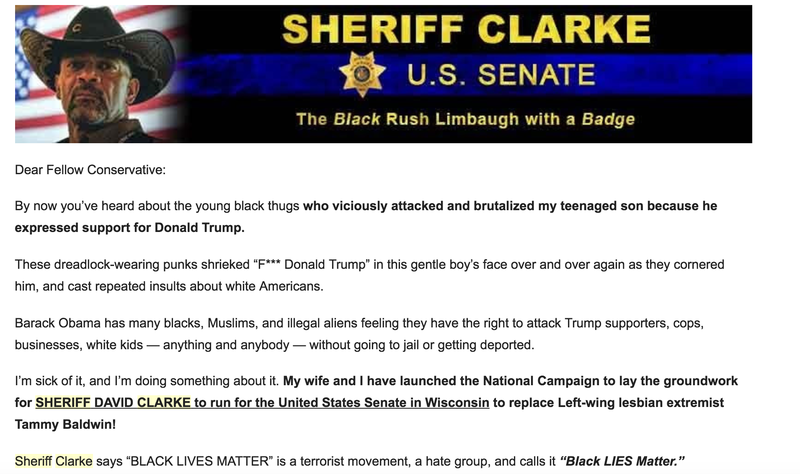 The PAC has frequently made racial appeals for money, citing alleged “roving mobs of black youths who have been trashing malls across the country” as a reason to support Clarke — until recently, a black law enforcement officer — in his fictional Senate bid. The PAC targets potential donors through direct mail ad campaigns — which are known for being more effective with older voters. Daly has built his email list by renting other organizations’ email lists, according to FEC filings. Email lists are valuable to PACs in two ways: it’s an easy way to ask known supporters for money, and it allows the PAC (or whoever owns the list) to loan out those names and email addresses to other PACs — for a price. Political organizations will often dish out tens of thousands of dollars for access to ready-made email lists of potential donors.